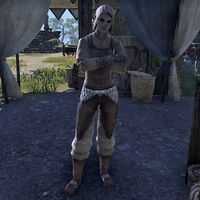 Dumurzog is an Orc merchant who can be found at the marketplace in Alcaire Castle. When spoken to, she'll say, "I was going to sell apples today, but someone started throwing them at people. Then the guards shut me down. Now everyone gets rocks for free instead. Go figure." This page was last modified on 21 December 2018, at 08:21.